Here at Magnificent Moments Weddings, we get to work with some pretty amazing couples and we love nothing more than helping them make their wedding dreams come true. So we thought it would be fun to shine a client spotlight on some of our past brides! We want to share how awesome they are with you (no really we have the BEST brides!) and give them the opportunity to relieve their special day! So this month we reached out to Kathryn and asked her to share her greatest memory and any tips she may have for soon to be brides! There were many and few at the same time, because it goes by so fast! It was the little moments alone with Andrew that were my favorite. When we ended the ceremony and walked back down the aisle and out of the doors at the chapel. It was the first moment I’d had alone with him all day, and first time I’d really seen him that day. I got to kiss him as my husband, in a private moment before the photographers and videographers got there! Such joy. Otherwise, it was seeing my grandmother for the second to last time. I wasn’t sure she was going to get to be there, and so seeing her at a day we’d talked about since I was little was a dream come true. Otherwise, there were sweet, sweet moments with my parents and my bridesmaids before the ceremony. It’s amazing walking down the aisle and seeing everyone you love in one place. It’s hard to narrow it down but here are my Top 4! See the last question below and hire a wedding planner or coordinator! When you hire said wedding planner, allow them to take on tasks and delegate, even if you like being in control, they are there to help! Don’t worry about pleasing other people so much! I was trying to make sure everyone had the perfect time and thinking about what everyone would like/not like. You can’t please everyone, and it’s you, your groom and your family’s day. Your guests love you and are excited to be there. Set a date (1-2 weeks) before the wedding to be done with everything, except for the few things you need to do the last week such as taking items to the venues. Do NOT be making goody bags, printing place cards, or going over the seating chart for the 1000th time. I was a (happy, joyous) zombie for my rehearsal dinner and bridal lunch. You don’t want that! You want to enjoy the last few days, because they’re over in an instant. The most important advice: plan/prepare for a marriage that’s more beautiful than your wedding! Short answer: There are the little things that didn’t go ‘perfectly’. Like that I really wanted to wear and had planned on wearing my grandmother’s mink stole for our exit. And we ran out of time for a lot of full bridal party pictures. I had planned so many little details that didn’t happen, but that’s okay! Otherwise we would have liked more time with all the 200+ people we love. Altogether though, I love planning weddings and perfecting details and would love to do it all over again with the same incredible team of vendors, just a slightly different design. We used ivory, gold, and greenery with blush and burgundy to play up rich winter colors. However, I’d love to plan a spring wedding with all white, gold, greenery and blush. Still simple and elegant, just a bit softer and more organic! 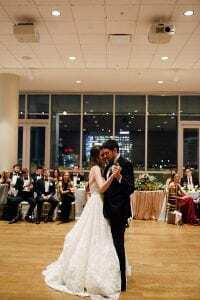 Why did you choose Magnificent Moments Weddings? I didn’t want a wedding planner at the beginning! I knew I had expensive taste, and I am very organized, so I figured that having a planner wasn’t necessary and would majorly eat into my budget, which I wanted to use for other things! However, my mom convinced me that I needed someone because she couldn’t help me as much as she wished, due to her health and taking care of my grandmother. Plus, I was out of state in Virginia. So, she convinced me that I needed one. 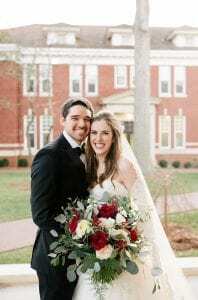 As I searched, a wonderful vendor at Ballantyne recommended Magnificent Moments Weddings to me. My mom and I both talked to Amanda and we loved her instantly. She was experienced, prompt, creative, talented, etc. and we never looked back! See my google review for more gushing. MMW is 100% worth it. Absolutely 100%! And when you do, hire Magnificent Moments Weddings. Trust me it’s worth the investment. They’ll allow you to be as hands-on, or off, as you wish. Thank you, Kathryn, for all your kind words! You and Andrew were truly an amazing couple and just a dream to work with! 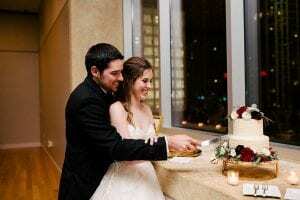 Your wedding will always be one here at Magnificent Moments Weddings will remember fondly!